The engineering equivalent of a "Kick Me" sticker. Time Warp this with Mimiron's Head and then Molten Reflection for an easy 32 dmg. You put pants on them. I just won because of this card. I only had 8 health remaining while my opponent had over 20. I had a Summoning Stone, Kel'Thuzad, some other card, and Innervate. The only reason I won was because my opponent couldn't make Kel'Thuzad vulnerable all thanks to this thing. 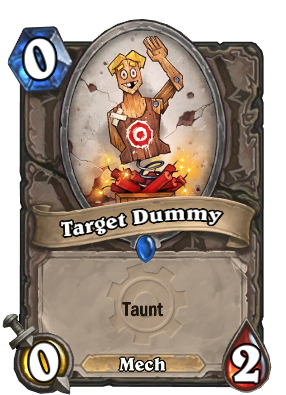 Any other Taunt card could've done it, but I'm happy it was this one. Yes. I just wanted to run through the collection as fast as possible, without investing too much time. So I just Ctrl/V'd my way through all 43 cards. Now you know, at a glance, where my annoying-self has been. :) I might go through and edit them later, but I feel like I've spent too much time already just responding to your reply. Thanks for the query, though. Yeah, I'd think: "oh my god what the hell is this guy's deck easy win lads"
Real problem of this card is that its a card and not a side effect of some other card. Mechs have pretty much zero card draws on their own and this is not a card, this is basically an empty space which could be a card. Somewhat playable when you are at turn 0-4, absolute garbage later on when you run out of steam after spaming with mech warper combos. Probably only rare so you won't get them every second pack like you can with wisps. It is a Mech, so with Iron Sensei or other cards that buffs the Mechs, it could become interesting. Hemet Nesingwary kills only Beasts, for 5 mana, and he is a 6/3. He is unplayable in any deck. Just wondering is this supposed to be a reference to Alex From Target? since gvg came out around the same time as that "news story" i wanna know if its a coincidence or not. Just like to mention that I saw this played on turn 2 next to a Whirling Zap-o-matic, followed by a Flametongue Totem and Dire Wolf Alpha. Stars aligned well, but I liked the use of the dummy here since I had no direct damage. Since Edwin VanCleef is my favorite card, I support these deceptively useful little buggers. Actually just won a game with a couple of them doing nothing more than protecting my other mechs. Can someone explain to me how is this a rare????? Is it because Target (the company) said so? free mech synergy. this goes in all my combo mech decks to be sure. Dude is on a stack of dynamite, but has no attack! Its an Easter egg, when you kill it, it deals 10 damage randomly split between all characters.